How to TRAIN a child . . .
with all your heart, all your being and all your resources. 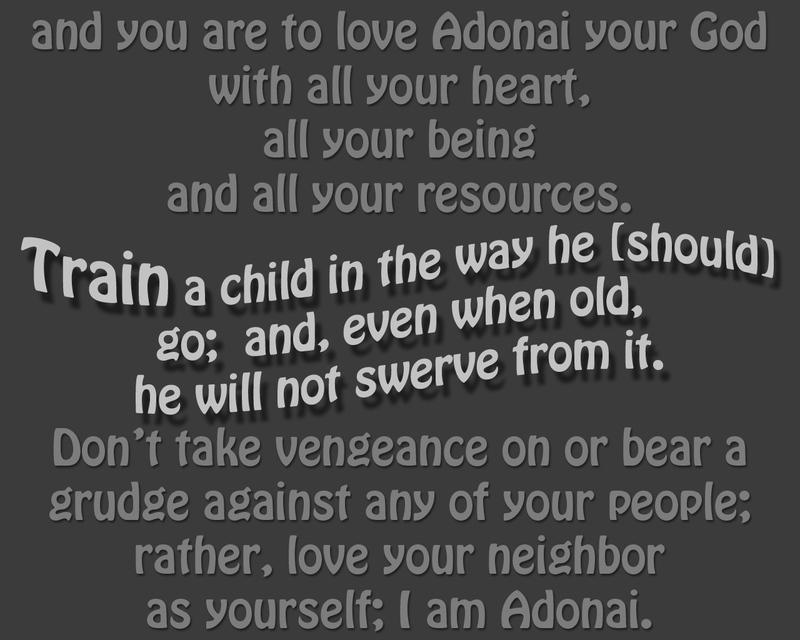 rather, love your neighbor as yourself; I am Adonai. JUMP RIGHT OFF THE PAGE . . .
just as the covenant he mediates is better. on the basis of better promises. John 3:16 that everyone knows is dependent on these two commands. The Gospels are dependent on these two commands. The New Testament is dependent on these two commands. is also the most important command in the text that also has commands associated with it – to do in conjunction with. We are ordered to do them . . .
COMMANDED to do them . . . In other words, you are not obeying this command unless you obey it in the way that God prescribes that it is to be obeyed. ‏צָָוה‎ tsāwāh: to command, to charge Thoralf Gilbrant, ed., “6943,” in The Complete Biblical Library Hebrew-English Dictionary – Pe-Resh, (Springfield, IL: World Library Press, Inc., 1998), WORDsearch CROSS e-book, Under: “6943”. of the “mind” as the center of intellectual activity. You must speak them . . .
You must repeat them (sharpen them) . . .
Have you ever set down with your children and taught them this? Do you children know the most important command in the text? Do they know where it is at in the text? Do they know the verse number, the chapter? Again, does this mean sometimes? Part of the time? Rarely? When you feel like it? When you remember to do it? Again, does this mean sometimes? When you feel like it? When you remember to do it? What kind of children do we raise if we follow this most important command? If we love God in the the way that he commands us to love him, this is NOT optional! and, even when old, he will not swerve from it. I failed my own children. I didn’t teach them these commands. We didn’t talk about them in the morning when they got up – throughout the day – as we traveled down the road – or at night before we went to bed. I have regret for my sin in not doing this – I have heartache. I hurt my children by not doing this – I hurt myself by not doing this – I hurt my marriage by not doing this. Ben was our second chance. Our chance to turn from our sin and do it right. The following 5 short animations are true stories. Ben and I did these when he was 5 years old. These are good examples of what happens when you DO obey this command. Ben calls me DahDah and we call him Mr Beans. That seemed like the best title for our series – DahDah and Mr Beans. As you can see, Mr Beans loves God with all he has! It is to be who we are – our inner self. Love God with all you got, all the time, and love your neighbor. Teach it to your kids. Repeat it over and over until it penetrates their inner self and becomes who they are as well. This entry was posted in Living life Even if . . . and tagged 2 most important commands, train a child. Bookmark the permalink. 2 Responses to How to TRAIN a child . . .